While construction and site development have not yet begun, Modern Doral has already garnered a lot of curiosity and interest. Without a doubt, the property in high-end, gated Doral community will become a well sought-after place to live. Under development by Terra Group, the entire community has a look and style that is kind of new to the area while, at the same time, a new contemporary design that seems to be coming to the forefront of more urban neighborhoods. Terra Group is a Miami based developer known for developments such as such as 900 Biscayne Bay, Reserve at Doral, and Quantum on the Bay just to name a few. In Doral, they are also in the midst of developing two other new communities -- Vintage Estates and Doral Cay. Located in the heart of Doral, Modern Doral is situated on 74th Street between 94th and 107th Avenues. It is close to the major thoroughfares and arteries into and out of Miami and South Florida not to mention Miami International Airport. Modern Doral is also within a short drive to the exclusive Doral Golf Resort and Spa as well as gorgeous area parks and excellent shopping. Ranked #2 on Forbes Magazine’s List of “Best Places to Live,” Doral is a great place for people in any phase of their lives to settle down. Because of the increase in professional business and high quality schools and the quality of neighborhoods, Doral has become a great place for families. Doral’s population has more than doubled since 2000. 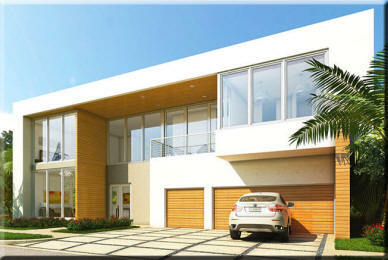 The homes in Modern Doral will take on a new appeal and luxury in a community that has a very “modern” atmosphere. While the details have not been released on the individual amenities in each home, one can only assume that the fixtures and finishes will be of the highest quality and style to compliment the architecture of the homes. As for community amenities, the community will feature a private 24-hour guarded gate, lush, tropical landscaping and a great clubhouse with community pool. Additionally, Modern Doral will feature an adjacent shopping center to be anchored by a grocery store and other retail stores. As the population increases so too does the need for necessary conveniences. Modern Doral will be made up of three separate subdivisions that encompass three different styles of homes. Two will feature single family homes while the third will feature smaller cluster homes. While the style and look of the homes will be similar, they will vary in size from slightly more than 3,100 square feet to over 4,400 square feet. Pre-sales have begun at Modern Doral. The first group of reservations is set to go to contract in the next month or so. Site development will begin in September with construction on homes starting in December. The first move-in is slated to be somewhere around may 2014. List prices for homes at Modern Doral fall between the mid-$700s and mid-$800s for the smaller cluster homes to almost $1.3 million for larger homes. The following payment schedule gives potential buyers a rough idea of what is expected to buy property in Modern Doral: reservation -- $50K to $100K depending on the lot and size of home; at contract -- 10% of the sale price; site development -- 5% of the sale price; home construction -- 5% of the sale price; roof top out -- 10% of the sale price; and, closing -- balance of sale price. Because Modern Doral is featuring a new take on design and architecture, it is a true departure from the norm. Martin says “this is our last opportunity to develop something in Doral, and we want to do something design driven,” in the same Miami Herald article mentioned earlier. With the area being almost full developed, land is not something that is abundant. Potential buyers who like a clean, contemporary style should definitely consider Modern Doral. It appears to be a very sophisticated and upscale neighborhood that will also be in high demand.